We are getting everyone in the holiday spirit by welcoming Aaron and Uncle, from Uncle (the podcast) to episode 150 of Bumming with Bobcat! It's become a holiday tradition to throw back some fine beverages with Aaron and Uncle as the holiday season rolls on. Last year the guys brought along some Santa Wine to the show, but this year they have taken it a step further by bringing along a classic 40oz of Hurricane High Gravity Malt Liquor to enjoy! 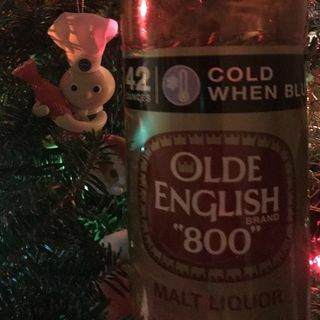 Sadly, I still can't get my hands the ... See More Hurricane HG in my area, so I bought along a 42oz of Olde English 800 to the holiday party instead! Are you ready for Uncle's New Years Revolution? The guys are giving out all the details on the big NYE event, and I will make it a point to call in and join them this year! What are some tips to help everyone get through the holiday season? Will Ryan Seacrest take them up on their offer to be a guest on the show? Make sure to keep an eye on Uncle as he battles this category 5 hurricane throughout the episode! Word from MillerCoors is that there's a new Steel Reserve Alloy Series Spiked Tropic Storm set to debut in January, but to hold us over until then we cracked open a can of 211 Spiked Watermelon to enjoy for Tall Boy Thursday!